« Are You Getting Your Money’s Worth from Washington? I realize this may be a thought crime by DC standards, but it sure would be nice to eliminate the high tax rates that undermine economic growth and reduce American competitiveness. At the risk of sharing too much information, I fantasize about a world without the internal revenue code. In addition to getting rid of high tax rates, I also want to abolish the pervasive double taxation of income that is saved and invested. Just as important, I want to wipe out the distorting loopholes that tilt the playing field in favor of politically connected interest groups. And I daydream about how much easier tax day would be if ordinary people didn’t have to figure out how to comply with an ever-changing tax code. But perhaps you’re a normal person and you don’t dwell on these topics. Your fantasies probably have nothing to do with fiscal policy and instead involve that hottie in your neighborhood. That’s fine. I’m actually envious of well-adjusted people who don’t fixate on the cesspool of Washington. But – at the very least – I want you to agree that America needs fundamental tax reform. And to help persuade you, here are some fresh stories to remind you that the tax code and the IRS are a blight on society. For instance, how do you feel about the IRS engaging in partisan politics, as reported by the Washington Times. Even as the IRS faces growing heat over Lois G. Lerner and the tea party targeting scandal, a government watchdog said Wednesday it’s pursuing cases against three other tax agency employees and offices suspected of illegal political activity in support of President Obama and fellow Democrats. …the Office of Special Counsel…said it was “commonplace” in a Dallas IRS office for employees to have pro-Obama screensavers on their computers, and to have campaign-style buttons and stickers at their office. 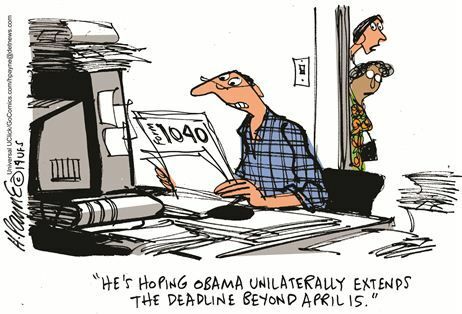 In another case, a worker at the tax agency’s customer help line urged taxpayers “to re-elect President Obama in 2012 by repeatedly reciting a chant based on the spelling of his last name,” the Office of Special Counsel said in a statement. …Another IRS employee in Kentucky has agreed to serve a 14-day suspension for blasting Republicans in a conversation with a taxpayer. For more information about this nauseating scandal, read the wise words of Tim Carney and Doug Bandow. Or what about the time, expense, and anxiety that the tax code causes for small businesses? Heck, even the Washington Post has noticed this is a big issue. More than half of small employers say the administrative burdens and paperwork associated with tax season pose the greatest harm to their businesses, according to a new survey by the National Small Business Association. Forty-seven percent say the actual tax bill hits their companies the hardest. On average, small-business owners spend more than 40 hours — the equivalent of a full workweek — filing their federal taxes every year. One in four spends at least three full weeks on the annual chore. There is also the expense of doing that work. Only 12 percent of employers filed their taxes on their own this year, down from 15 percent last year — and hiring help can be pricey. Half spent more than $5,000 on accountants and administrative costs last year. One in four spent more than $10,000. I was tempted to say compliance costs add insult to injury, except that understates the problem. Watch this video if you want to understand why the tax code needs to be junked. And let’s not forget that high tax rates are pointlessly destructive and bad for America. Dozens of companies have redomiciled in other jurisdictions to get out from under America’s punitive corporate tax system. And more are looking at that option. Here are some excerpts from a report in the U.K.-based Financial Times. By the way, “perceived political risks” is a polite way of saying that the team at Walgreens is worried that the company might be targeted by the crowd in Washington. In other words, it will be attacked if it does the right thing for workers, consumers, and shareholders. But that’s blaming the victim. All you really need to know is that America’s corporate tax system is so harsh that companies don’t just escape to Ireland, Switzerland, the Cayman Islands, and Bermuda. They even find better fiscal policy in Canada and the United Kingdom! Last but not least, do you trust the IRS with your confidential financial data? If you answer yes, seek help right away from a mental health professional and check out these stories. A new cost-saving computer technology being implemented by the IRS has left the agency vulnerable to hacking, putting taxpayers’ info at risk, an investigative report has found. …although the IRS has developed cybersecurity guidelines, many of the servers aren’t following them, said a report by the agency’s internal watchdog, the Inspector General for Tax Administration. In fact, the servers failed 43 percent of the tests investigators put them through, though they aren’t releasing what those tests and settings are due to security concerns. A U.S. Internal Revenue Service employee took home a computer thumb drive containing unencrypted data on 20,000 fellow workers, the agency said in a statement today. 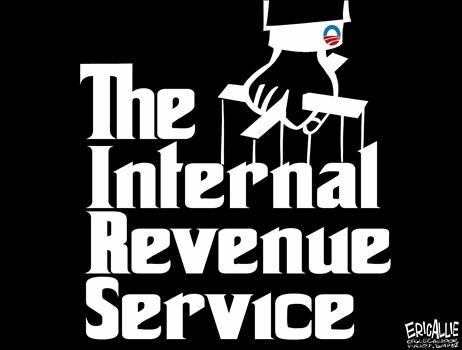 …The IRS said it’s working with its inspector general to investigate the incident. The IRS statement didn’t say why the incident was discovered now, didn’t include the name of the employee who used the thumb drive and didn’t say whether the employee still works at the IRS. So what’s the bottom line? I suppose there are different interpretations, but my view is that the system is irretrievably broken. It needs to be shredded and replaced. My real fantasy is to have a very small federal government. Then we wouldn’t need a broad-based tax of any kind. But I also have incremental fantasies. Until we can shrink the federal government to its proper size, let’s at least figure out ways of collecting revenue that are much less destructive and much less unfair. The flat tax is one possible answer. I’m also a fan of the national sales tax, though only if we first amend the Constitution to ensure that politicians don’t pull a bait-and-switch and burden us with both an income tax and sales tax! To be more specific, I’m a fan of the Fair Tax, but only if we make sure that politicians never again have the ability to impose an income tax. The college is convenient to I-287 near the New York/New Jersey border. Say hello if you attend. V-MAX has a point that it may take a systemic collapse before changes are made, however, I’m not sure whether demand will be for more government or less when a crisis hits. It’s time to stop sitting on the fence and decide which form of flat tax would be best. First of all, a “true” flat rate tax (no multiple rates, no standard deductions, and certainly no specific deductions; for individuals) would eliminate the need for the average person to file annual tax forms. This is the case for both a flat tax on earned income and a flat tax on sales. In both situations, it would be businesses that handle the filing, since any tax withholding would be accurate. According to the video, we could save close to $410 billion on tax compliance. However, without some level of progressivity, neither flat tax is politically acceptable. Therefore, some form of “prebate” might be appropriate. [Note that a prebate severs the distribution process from the collection process.] While the prebate distribution would be part of the new tax code and therefore separate from welfare and Entitlements, the amount of the prebate should reduce each of those by an equivalent amount. [And in the process, maybe get the federal government out of welfare completely?] The question is how much and how do you stop legislators from regularly upping the ante? Which Flat Tax? Both have serious flaws and major advantages. It would be relatively easy to create a hybrid flat tax that eliminates flaws. We will never get anywhere on a flat tax rate until we can agree on one format. Those are my Tax Fantisies! V-MAX, let’s not forget that Republicans are like Dan in that they often pretend to oppose the very existence of the IRS. The IRS, we are told by Dan, is “a blight on society”, and at times we hear such heated rhetoric from Republicans, too. Like Dan, Republicans are principled fans of “a very small federal government”. “Limited government”, they are fond of calling their policy. But is there even a scrap of evidence to support the suspicion that the GOP or Dan would ever kill the IRS, and prevent its replacement, if a majority sufficient to do so were acquired by such people? Well, no. Instead, we get foot dragging, and mealy-mouthed pragmatism, and empty rhetoric about “incremental” change through amending the Constitution, “to ensure that politicians don’t pull a bait-and-switch” when Dan, Cato Institute, and the Republicans replace the “broad-based [income] tax” with “a broad-based tax” of another kind, like “a national sales tax” or a “Flat Tax”, of which Dan is “a fan”. It should go without saying that none of these taxation schemes would work without an internal revenue “Service” to make it work, and it’s clear from the context that Dan wants a federal internal revenue agency to run the collection racket. Now, why would we need a national sales tax or a national flat tax if we don’t need “a broad-based tax of any kind”? Why would we want to exchange one kind of “broad-based tax” for another if the goal is to “shrink the federal government to its proper size” during OUR OWN LIFETIMES? And why betray the motives with facile grousing about America’s “harsh” “corporate tax system”? Something else is going on here with Dan, Cato, and the Republicans. But what? Maybe the phrase “its proper size” is just coded language for merely putting their own selves in control of the federal government, at which point the most significant changes in “DC standards” would be the logo on the gangsters’ cuff links and the number of $500k sailboats owned by these advocates for “a very small federal government”. Dan and the GOP talk a good game, but it’s clear that Democrats, Republicans, and Dan are enemies like the Crips and the Bloods are enemies, and like Jesuits and Protestants are enemies. Bleeding hearts and Democrats want a civil war in which their enemies won’t defend theirselves and in which they won’t abandon the “political process”. If, however, their enemies abandon the political process, the bleeding hearts and the Democrats will play the victim while demanding that cops and military suppress the opposition. So who are America’s law and order conservatives?